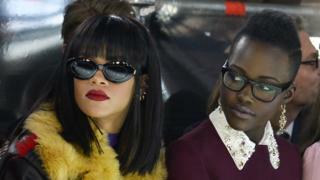 A photo of Rihanna and Lupita Nyong'o has sparked a film idea on Twitter and they have both taken to the social media site to say they are up for it. The 2014 fashion show photo was shared by fans with the comment: "Rihanna looks like she scams rich white men and Lupita is the computer smart best friend that helps plan the scams". It caught the attention of Oscar winner Nyong'o a few days ago and now Rihanna has tweeted she is up for it too. Fans have gone crazy for the idea. Lupita saw the tweet a few days ago and posted "I'm down if you are @Rihanna". More than 200,000 liked the tweet and earlier today Rihanna replied saying "I'm in Pit'z" - her nickname for the Star Wars actress. Another 99,000 liked that tweet and now the two stars had said yes Twitter went into a meltdown with ideas about the film. One fan then tweeted it over to Selma director Ava Duvernay saying she should direct it and Duvernay loved the idea. "Lights set. Camera's up. Ready to call action for these #queens," she tweeted back. It seems Rihanna didn't want to let go of the idea as she retweeted a fan's idea to get Issa Rae, the creator and executive producer of Insecure, on board. Rae then replied with a Gif of a cat manically typing, which made Rihanna blush. The idea of a movie based on the photo had been around on Tumblr when the photo was first published - but now the main players have got involved it looks like Twitter may have cast and created a movie. But with so many fan ideas contributed who takes credit for the concept and gets a cut of the profits? Most of the fans on Twitter though are just desperate to see it happen.